65 watt Dell AC/DC/Air Switchmode power supply, W1451with user adjustable output. Universal input AC 19.5 Volt, 3.34 Amp DC power supply, 65 Watts average, 120 watts peak. .This is a small switchmode power supply, 19.5 volts output watts peak. Originally sold with Dell laptops. It comes with a nice nylon fabric travel case, airplane adapter, cigarette lighter car adapter, and US AC cord. 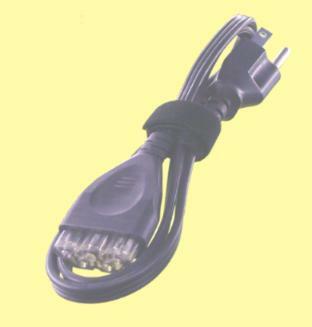 This adapter can be used in the airline in-seat power systems and it is provided with the special connection cable. 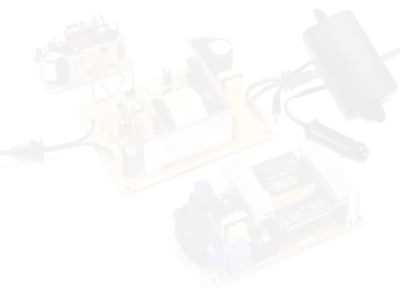 The air in-seat power systems are limited to an output of 75 Watts, these are 65 watt power supplies. Temperature 0° to 40° C Operating, overtemperature cutout is reset by removing and reapplying AC power. Comes with these two cords, which work for AC, Auto, and Airplane seats. For international use you need a country adapter such as the one at https://www.powerstream.com/plug-adapter.htm Never try to use another cord for the W1451 than those supplied with it, it won't work, and it may cause damage to the power supply. Universal input switchmode dc power supply with user adjustable output voltage. Special feature for OEMs and hobbiests. 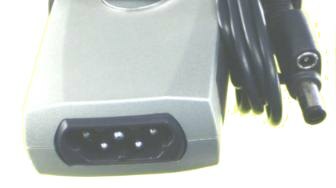 A a separate compartment opens, having screw terminals for attaching wires or cables to the output.